Mammoet cranes at Dubai Mall extension project. 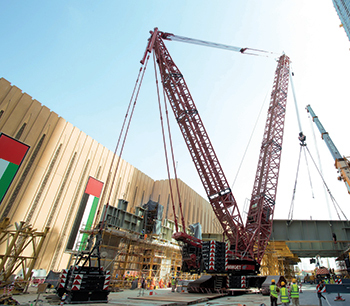 Mammoet, a leading provider of solutions for lifting and installing large and heavy structures, says it has played a key role in the Dubai Mall extension project. The company was contracted by Malaysian engineering and construction company Eversendai to help erect the new bridge that will connect the existing mall to a new section. The work involved the lifting and installation of 16 steel girders to form the base of the Dubai Mall’s Fountain View Link-Bridge, which will be home to retail outlets and provide a walkway to further parking. The project constraints meant the crane needed to have a minimal footprint and low ground-bearing pressure, says the company. Mammoet’s LR1750 was the only one available crawler crane in the UAE that complied with all technical requirements. It installed the girders, weighing between 83 and 172 tonnes, in two sections, it states. The lifts were carried out on Sheikh Mohammed bin Rashid Boulevard, the main road that runs around Dubai Mall. With only two out of six lanes closed to minimise disruption to traffic, the crane had to manoeuvre in a tight space. Also there was another engineering challenge; the water pipes underneath the area of operation supply Dubai Mall and the whole of Downtown Dubai, states Mammoet. To avoid damaging them, it was imperative that the Leibherr crane kept within the ground-bearing pressure tolerance, says the lifting specialist. Careful engineering calculations were made for the lifts to ensure that the LR1750 could lift the girders and manoeuvre in to place without nearing traffic, or going over the ground-bearing pressure limit, says a company spokesman. Mammoet installed the first set of girders on the Fountain View side of the road. The whole operation was then moved to the mall side of the road where the other halves of the girders were installed, ready for connection in the middle, he adds. Mammoet offers solutions for lifting, transporting, installing and decommissioning large and heavy structures in the petrochemical, offshore, power, and civil industries.